I read the first book in the series back in May and really enjoyed it. When I saw the second book was coming out, I jumped at the chance to read it, too. The book had so many beautiful descriptions in it. I savored the words and flew right into the world they were portraying. I was stuck between wanting to read the book as fast as possible to find out what happened next, and to slow down and drink in the way the words swirled together. I also found the first third of the storyline to be fantastically gripping. Then came a plot twist I had 100% not expected. The plot twist nearly made me drop the book. It was crazy. It’s probably my lack of mercy, but I had a really hard time with how the main character dealt with what happened. I won’t say more because of spoilers, ya know, but I’m still not sure I feel like it was adequately addressed in the rest of the book. That’s what took the book from a very solid four stars down to three stars. There was also a fair bit more romance in this book than I remember being in the first book, which also took the book down a little bit for me. 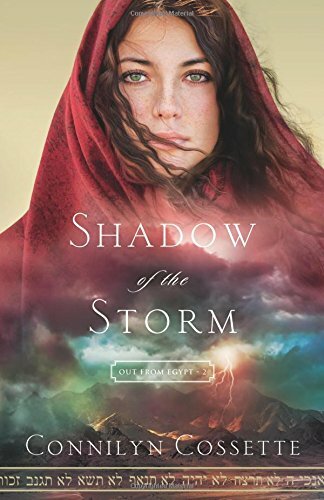 All in all, Shadow of the Storm was compelling, beautiful, and really helped the Exodus from Egypt come alive for me. Miss Connilyn does a fantastic job of skillfully weaving her words together and I look forward to reading the third book when it’s published. I’m giving Shadow of the Storm 3 out of 5 stars and 6 out of 10.